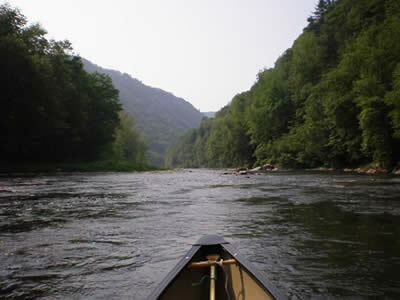 Pine Creek is located in Tioga County and is one of Pennsylvania’s most popular canoeing creeks. There are three sections to Pine Creek with the most popular section running through the Pennsylvania Grand Canyon (The Gorge) at Leonard Harrison and Colton Point State Parks. As Pine Creek winds its way through the wilderness you will experience great scenery, wildlife, fast flowing current, and slower pools of calm water that provide great opportunity for trout fishing. And despite it’s reputation of being one of Pennsylvania’s most treacherous whitewater paddling creeks, in reality Pine Creek is a relatively calm creek that can be successfully navigated by paddlers of even basic skill levels. Perhaps the reason for Pine Creek’s deceptive reputation is the excitement that is raised with the idea of traversing through one of Pennsylvania’s most scenic natural locations. And because Pine Creek offers much to experience beyond paddling, such as fishing, hiking, bike riding, and camping at the top of the list of nature related activities, the area is normally bustling with human activity drawing visitors from around the Mid-Atlantic region, and this activity helps to inflate Pine Creek’s whitewater reputation. 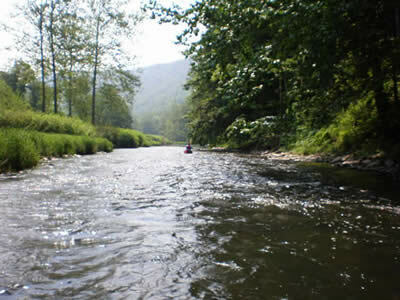 However, there is no doubt that Pine Creek is a creek that all Pennsylvania paddlers should experience. The Upper Pine can be accessed at Watrous, Gaines or Rexford, and is great for a one day (three to five hour) paddle to Ansonia. This is a favorite section of many paddlers and is great for fishing, novice group paddling, or a slow paddle with a young family. Remote camping opportunities are limited on this section of Pine Creek. Most canoeists choose to paddle the canyon section of Pine Creek. It extends from Ansonia to Blackwell and is approximately 18 miles. This section starts off very slow and narrow at the canoe launch actually on Marsh Creek. With the shoreline detailed in lush green growth, this slow, narrow water section winds on for a short distance before being greeted by Pine Creek where it widens significantly. In this section you may want to take opportunity to cast a fishing line or snap some photography at the wildlife opportunites that you will surely encounter. But don’t get too comfortable because you’ll soon need to prepare for your traverse through the Owassee Rapid. As you float gently along you’ll likely encounter fisherman and fishing camps on the right side of the creek. You’ll also notice the walls of the canyon rising higher and steeper above you. Eventually with the creek growing narrow, the terrain transforms to canyon like features. You’ll hear Owassee Rapid long before you arrive. 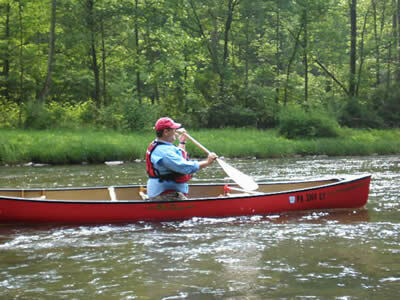 Under normal water conditions novice paddlers could easily navigate Owassee Rapid if they follow the left side of the of the main section of the creek. Attack Owassee Rapid on the right side of the main section and you will encounter rocks and waves that offer more of a challenge. But even at normal water conditions the right side is relatively easy to negotiate. Then there is the option of the extreme left stretch of the creek around the small island, this short stretch is marked “Danger” and I will not recommend you approach it. For more information on paddling Pine Creek go to Pine Creek Outfitters. Camping in the canyon is regulated through permit camping only and is only allowed in a 12 mile section of the State Park. Camping is forbidden in a section of regulated area just below Ansonia. About nine miles below Ansonia you will encounter the primitive campground Tiadaghton located on the left shore. Campsites come complete with fire pits, picnic tables, water and primitive toilets. You’re likely to encounter picnickers, fisherman, and large groups of bike riders at Tiadaghton. There are unofficial campsites on the left and right sides of the creek below the Tiadaghton campground, but they are few and may be difficult to acquire during crowded weekends. For more information on camping visit the Pettecote Junction Campground Website. Another convenient camping opportunity may be at the commercial campground at Cedar Run. It may not be camping in the wild as you might have hoped and it is a longer paddling trip of about twenty-four miles through some slow flatwater, but it does make paddling Pine Creek more convenient by allowing you to paddle through the canyon to your waiting basecamp. 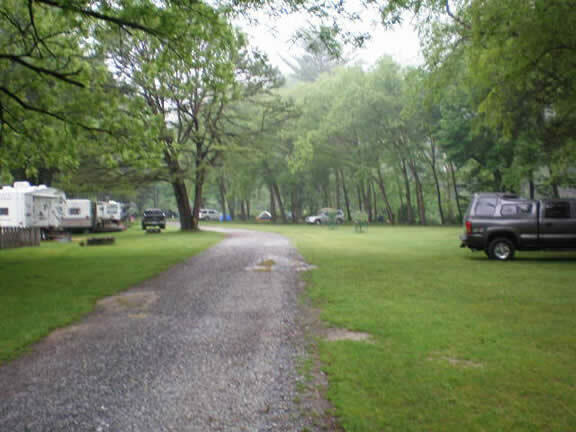 This campsite has plenty of human activity, showers and running water, and is perfectly situated on Pine Creek for fishing and nice evening walks along the creek. The Middle and Lower Gorge section extends from Blackwell to Waterville and is approximately 28 miles of class 1-2. This scenic section of Pine Creek provides great fishing opportunity. Access points are at Slate Run, Black Walnut Bottom and Hamilton Bottom. Pine Creek offers a safe level of paddling excitement, camping, fishing, wildlife, hiking and beautiful mountainous scenery. Water levels are adequate until mid June, or into the summer after heavy rains. On this creek you could enjoy a one day journey or several days of scenic canoe camping. 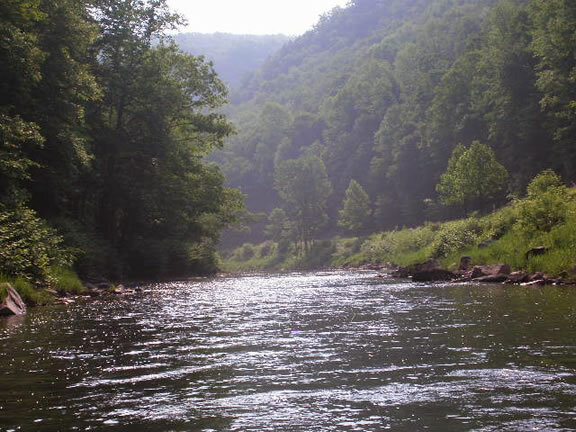 Have paddled Pine Creek many times and consider it my favorite creek in Pennsylvania. I just went to the Grand Canyon and we canoed Saturday and Sunday and we had an absolute blast!! Definitely recommend!!! A must see and do on your paddling list. Put in at Marsh creek access area with camping gear, took out at Tiadaghton for an evening of camping(arrive early to get a site and make sure you get a camping permit from the Tiadaghton State Forest), got up the next day, loaded the canoes and continued down to Rattlesnake Rock to take out. Great paddling, and above EXCELLENT scenery and wildlife. The PA Grand Canyon is a destination all Pennsylvania paddlers should check out. I try to do it every year. looking to do a 3 day trip down pine creek to rt 220. anyone out there have any idea how far up pine creek i should start to make this trip. i was thinking of starting in slate run, but i would realy like to see the upper section of the canyon. A group of friends and I did a 3 day paddle trip down Pine Creek. We started as far up as PCO would take us up Upper Pine (about 15 miles from the entrance of the gorge) and ended up at Black Walnut Bottom. The trip was AWESOME. The creek has a good variety of rapids and flatwater, especially once you get into the canyon. On the third day it rained all day and my friends’ canoe tipped in the rapids twice, so be weary. We’re looking to go again in the fall. Is there any part that I can take may 86 old father and fly fish without risking tipping over. He cannot swim but loves to fish. Where is there to canoe and camp on your way, like a two day trip?